Remember my old friend Henry? Today was our 2nd visit with him, and this time my lil' guy tagged along. 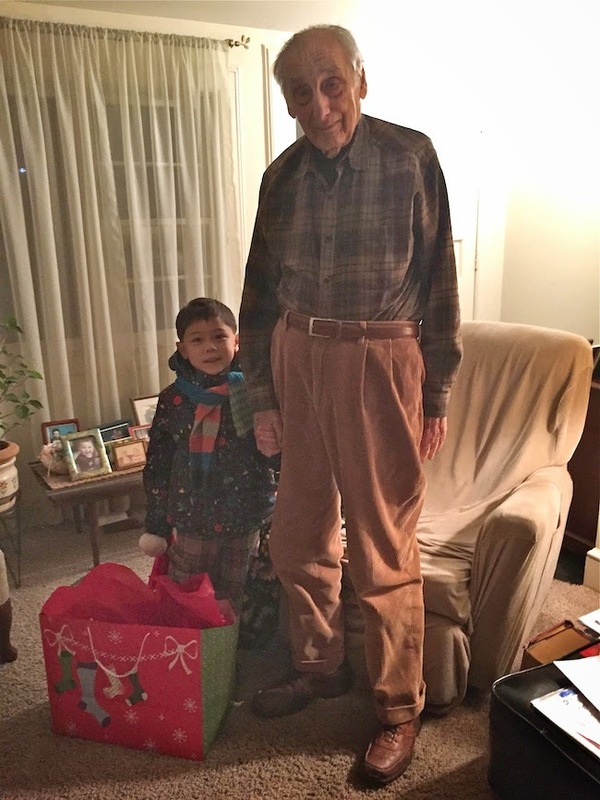 He was tickled pink to meet Henry, and was dying to ask him about war questions! Ahh…BOYS and they're fascinations. Henry was drafted during the Korean war for 3 years. However that wasn't his original plan. When he heard that they were going to start drafting people Henry went to apply for the air force. The application process was long as they cross checked all information and were very selective. During that wait time he unfortunately caught pneumonia and that was an immediate disqualification from the air force. However a week later he was drafted into the army and shipped off to Seoul. It sounded like bittersweet times for him, as I think true for anyone who's been through a war. Switching to a happier topic we gave him his Christmas gifts. A 2015 calendar and a 3 pack of socks. I remember my late grandmother Nan loving her calendars and keeping track of dates. 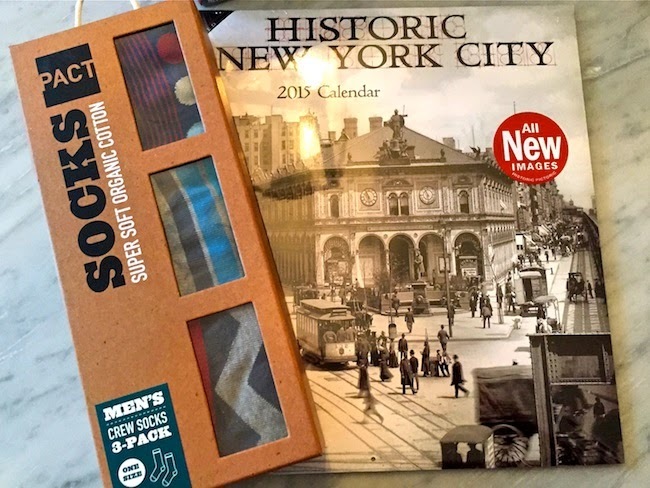 I think Henry is probably the same, and also this calendar we got him has old pictures of NYC which could be nostalgic. The socks were an after thought, but I saw them at Wholefoods and thought oh cool! They're quite hip designs for an old man, but I remembered from before that Henry is a Fashionista and could appreciate a good looking sock. Henry use to work at Macys for 40+ years. Starting out as a sales clerk, to department manager and working his way to the top controlling the vault. On our last visit he was saying how he use to do all the shopping as his deceased wife Alice hated that chore, so instead she use to do the finances! CUTE. But since he's not use to wearing that hat he struggles now to manage his bills, besides that he's only living on one social security income now since Alice's passing. TOUGH huh? 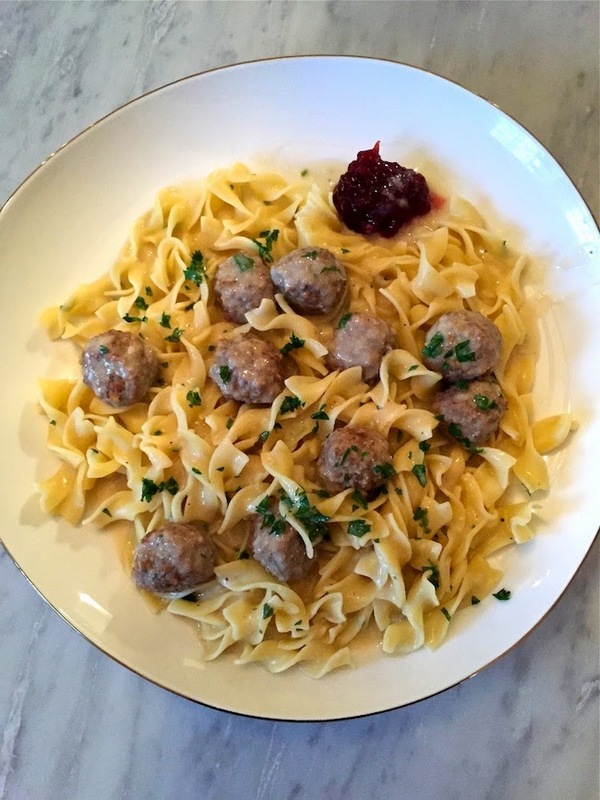 Along with the gifts we brought him swedish meatballs with lingonberry sauce over noodles as a meal. Perfect heavy comfort food for our winter weather. Here's a recipe to try which I doctor a bit. We eat ours over egg noodles so make double the sauce so we can drown in it, but I go easy on the cream so it's not too rich. YUM. Sure does beat Ikea frozen meatballs! Don't look too closely at ingredients though because it's not a weight watchers meal. However, no worst then mac and cheese. That's my only consolation! HA. 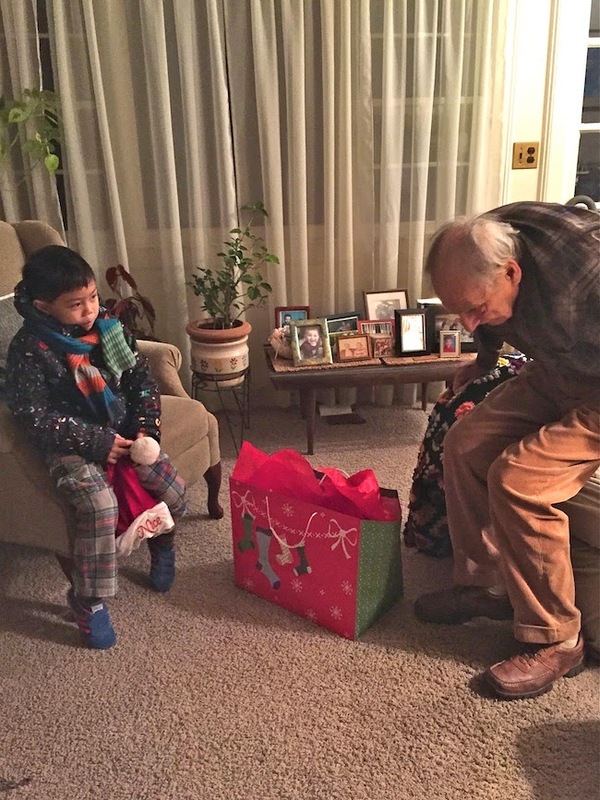 Curious what Henry's doing for Christmas? We were! We learned that Henry is planning to go to Rhode Island for Christmas to spend with his niece, her husband and 2 teenage boys. He sadly ended up spending Thanksgiving alone at home, because couldn't figure out a way to catch a ride back home. BOO. We hope that the same scenario does not happen for Christmas, and he is able to coordinate with all his family members to catch a ride there and back. We will find out in the New Year on our next visit how he spent Christmas. Fingers crossed and weather permitting he has a very Merry Christmas with his family. I would hate to find him alone. Till next time Henry!